Dr. Carlos Cardenas, Doctors Hospital at Renaissance Chairman of the Board, was installed as the 152nd president of the Texas Medical Association on Saturday. 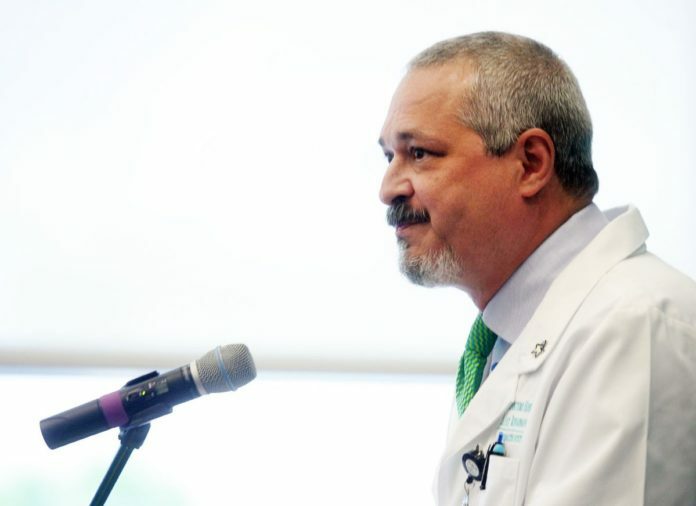 HOUSTON — Edinburg gastroenterologist Dr. Carlos J. Cardenas, MD, is the new president of the Texas Medical Association. Cardenas was installed Saturday as the 152nd president of the organization during the association’s annual conference in Houston. In his 28th year of practicing gastroenterology, Cardenas chairs the board of DoctorsHospital at Renaissance, which he helped found and serves as chief administrative officer. Cardenas has along history of service to the association having chaired its governing body. Prior to joining the board in 2005, he served five years as a member of the TMA Council on Legislation, and was legislative chair of the Border Health Caucus, to which he still belongs. He is a delegate in TMA’s House of Delegates. Cardenas also is a member of the TMA Foundation, the association’s philanthropic arm; a TMA liaison to the Coalition of State Medical Societies; and is a founding and Patron Club member of TEXPAC, TMA’s political action committee (on which he also served as a district chair). Cardenas regularly advocates on behalf of medicine and patient care. He attends TMA’s “First Tuesdays at the Capitol” legislative lobby days each session, has testified numerous times before the Texas Legislature, and has advised elected officials and policymakers in Texas and in Washington on health matters. Cardenas also served as president of the Hidalgo-Starr County Medical Society, of which he still is a member. He also appeared several years ago in a series of informational TMA “Hey, Doc” videos, designed to explain the new federal Affordable Care Act. TMA produced the videos and other material to inform patients — and physicians whose patients often turn to for answers — about how to adapt to the new health law. He also helped lead TMA’s fight for medical liability reform, which became Texas law in 2003. Doctors in the Rio GrandeValley and a few other Texas cities planted that seed when they believed rampant medical liability lawsuits eroded patient care. Cardenas received his medical degree at The University of Texas Medical Branch at Galveston, and completed his residency training in internal medicine and gastroenterology at Scott & WhiteMemorialHospital in Temple.